The Mt. Ellen Trail as it wraps around to the shady north side of the mountain. 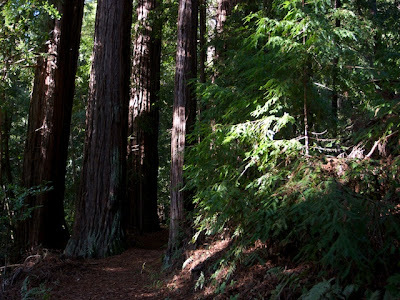 Memorial County Park is probably most known as home to some of the best camping deep in the Santa Cruz mountains, the number of trails in the park however is fairly limited. Nearby Sam McDonald County Park and Pescadero County Park are larger and have long loops trails, but for what its worth the Mt. 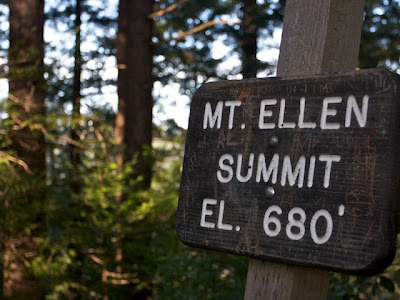 Ellen trail is a perfect afternoon getaway from the noise of daily life. The trail is short but sweet and in its remote location feels like a real retreat. - Turn Left on Pescadero Creek Rd. - Turn Left into Memorial County Park. As they often are our Weekend had been filled with household projects, farmers markets, and activities centering around our apartment in Mountain View. By noon on Sunday though I had a serious case of wanderlust and Beylah began to recognize that if I didn't get outside soon I might actually explode. Without much planning we simply hopped in the car with a general idea that it might be nice to go hiking somewhere new. That lead us to Memorial County Park. Redwoods with particularly colorful bark near the trailhead. The trail to Mt. Ellen starts across the street from the main park entrance. We paid the fee and parked inside the park on a chilly December afternoon after driving on windy roads for a considerable time. The air was crisp and still smelt of rain which lingered in puddles from several days ago. After donning our jackets we kicked off up the trail which rose steeply up the slopes of the mountain. 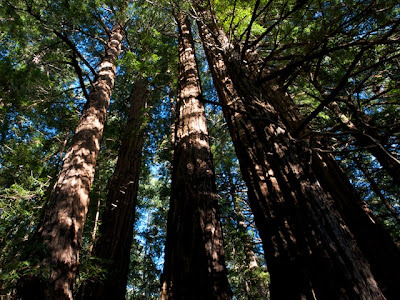 The trail immediately passed through a thick redwood forest with several glorious redwood groves with bright red bark and thicker than usual trunks indicating some age (though they were not old growth). It was mid-afternoon and already the sun was dropping low and casting long shadows through the forest so we picked up our pace. 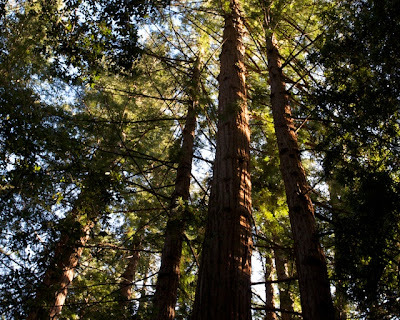 Towering redwoods near the start of the trail. The trail climbed for the next mile up switchback after switchback steeply enough for both of us to work up a little sweat, which given the cold weather only chilled us further. Still, the hike was pleasant and by no means truly strenuous. The little workout was appreciated. 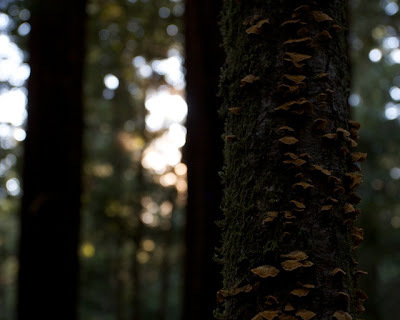 As we gained elevation the redwoods gave way to a mixed pine forest and on the approach to the top windows along the trail opened up unobstructed views across the valley over the emerald hills covered in forest. The mixed pine forest with glances of views through the trees. 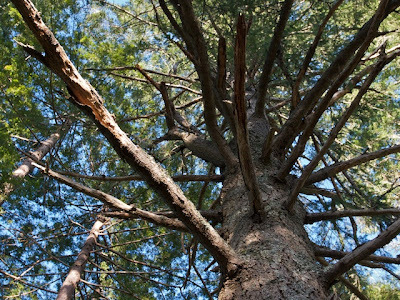 Lots of snags covering the lower part of a large pine tree near the summit. Before we knew it the trail wiped around to the shady north side of the mountain and then kicked back as it followed the ridge line to the summit marker. The views from the summit itself were not extraordinary even though the summit looks out over two impressive valleys and over to the beautiful Butano Ridge. Since the views were obstructed we ate a quick snack and decided to descend shortly there after. The summit marker, at 680ft. its no Mt. Whitney, but it's fun reaching the top. The loop continued down the ridge a short ways before beginning a moderately paced descent down the hill back through the pine forest and eventually sinking into the redwood groves. We plodded through the forest, stopping often for me to take photos. As we walked I explained the plot of "Deliverance" to Beylah, who was not impressed with the concept. Eventually the dull moan of car engines filtering through the forest became louder and louder until I felt like I could hear each piston firing in the clear, crisp air. Then we were back where we began, however I was much happier. We were both ready for the week ahead with our batteries recharged on the trail up Mt. Ellen. Lichen clinging to a small Alder trunk near the trailhead. "As we walked I explained the plot of "Deliverance" to Beylah, who was not impressed with the concept." Oh man, classic! 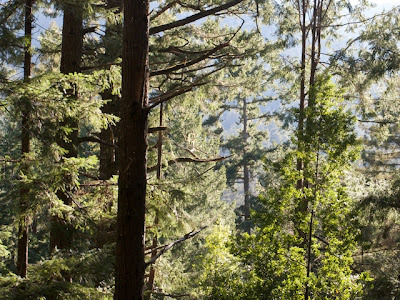 Love those pics of the tight forest trees, looks like a great hike! @ADKinLA - It's a great hike, normally I'm not quite satisfied with such a short hike but in this case we felt pretty great afterwards. One of those little guys that punches above it's weight class. I really like trails like that short and sweet. @Beylah- the movie is pretty intense and while you might swear off rafting for awhile it is worth a viewing.